Sir Thomas Lipton, a man respected in both England and America for his great sportsmanship, built Shamrock V in an attempt to win the America's cup. This was the fifth vessel that he built for this endeavor. These vessels, all named Shamrock, were always painted a fine dark green. In the background, the brand new Normandie, of the French line, has anchored to load passengers. 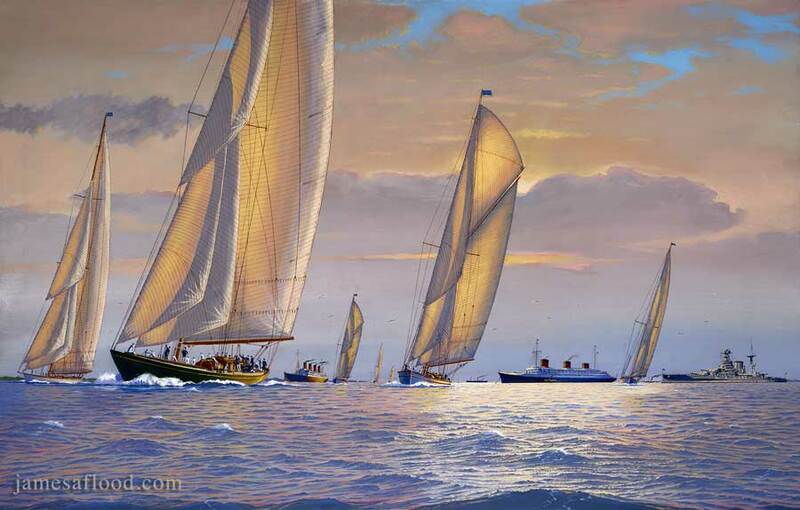 In this painting the year is 1935 and many J-boats had adopted the triangular Marconi mainsails. Here, the Shamrock V and other J-boats are racing in the Solent. After the thirties the J-boats no longer engaged in friendly rivalry, as the impending war intervened. In the background the brand new SS Normandie, of the French line, has anchored to load passengers. Sharing this background, HMS Barham, a British battleship, serves as the committee ship. In the distance, Cunard Line RMS Scythia and RMS Aquitania move towards the horizon as they commence fresh voyages.